The Rivera d’Ebre is quite unknown despite offering a wide range of exciting activities being located on the bank of the Ebro, Spain’s 2nd biggest river. Debbie has a huge amount of equestrian experience and loves horses. So there are four of them nearby. Nick is your guide when it comes to discover the region by bicycle or motorcycle. He was a motorcycle instructor in the UK. The off grid house is a cosy, hidden place with an all window porch, my favourite spot for breakfast. The local town Móra d’Ebre with its shops, restaurants and amenities is within easy reach (10 min drive). This is what Nick offered to us and he meets all guests personally wherever possible. It feels great, when you don’t have to search your holiday-letting by yourself! Especially when we arrived there after a 1,5 hour ride from Barcelona and it was already night time. Leaving Móra d’Ebre, we went first on an tarmacced road through fields of olive trees lit by the moonlight! Woooww, the adventure had started already! After about 5 minutes, we turned into a rough little unmade track, leading for about 1km to a little forest of pine trees. The rough road is suitable for most vehicles and bikes unless they are particularly low. Finally we arrived at our new home for the next 2 days. The total silence was just interrupted by the typical summer sound of crickets. Nick explains us that in 2017 during their first year abroad from the UK, he and his wife Debbie enjoyed this region around the Ebro river and its culture so much, that they decided to buy a 2nd house 200 metres from their own when it was offered to them to have another place for family & friends who were visiting. VIDEO: from the rooftop towards the forest. Now they’re delighted to share with their guests what they’ve learned so far about the region and the local customs. 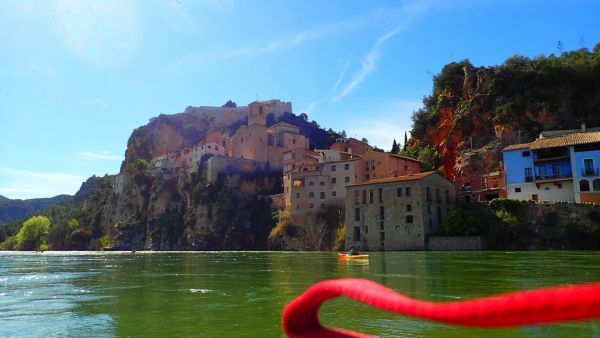 They offer ecotourism and Catalan adventures at its best! The name of their project: Catalan Adventure. Indoor sheltered patio with a table and big open windows which make you feel like you are sitting outside. Big open modern kitchenette area with a gas hob and fridge with freezer. 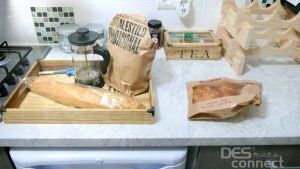 The kitchenette is stocked with coffee, tea, milk and all the basics you require on arrival, even napkins, candles or spare light bulbs without too much clutter! 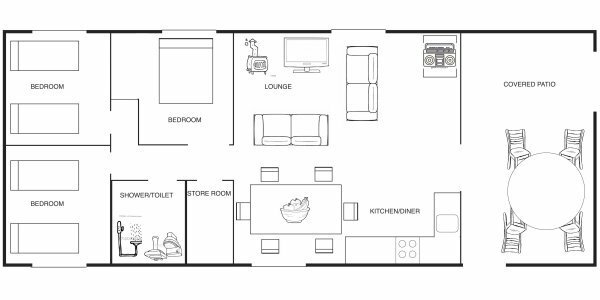 Large dining and living area with a log burner, TV with dvd player, music system, WiFi plus a selection of maps, books and family games. Great goodie: a Welcome Pack! dishwasher, oven, toaster, microwave, electric kettle, hairdryer and other electronic devices which use might be harmful in terms of energy storage. Off grid property users need to be particularly energy conscious. … but there is ample power for lighting, TV, phone charging and computers etc. … but the local town has an excellent outdoor swimming facility with two pools, a restaurant bar and sunbathing area with loungers at very reasonable prices. Here we have a real 100% off-grid house, so what does that mean for the guests? All the energy you use comes from the brand new solar electrical system with solar panels on the rooftop of the house with 48 kW supply. With this, the cottage has a good capacity. The water comes from a local source, it is not drinkable but definitely good enough to take a shower and wash up with. Since it is a limited resource, the owners kindly ask you to make responsible use of it, for instance turn off the water while shampooing your hair etc. The toilet has a natural drainage, so they ask you to leave the toilet paper and every other external papers outside when flushing the toilet. There are special bins provided where you can leave them. Depending on your preference, you can enjoy silence and seclusion, as well as trying various activities such as a day out mountain biking, fishing, sailing or cruising the Ebro River by boat. 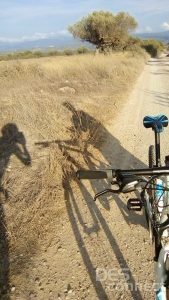 The Camí Natural VIA VERDA Ebro GR 99 passes by the Ebro river and offers a lovely way to discover the area by bicycle between Tortosa, Amposta and Deltebre, the only little town right in the Delta del Ebre. Try the lovely Catalan cuisine with a Menu Del Dia in a local restaurant. Debbie and Nick are happy to help you arrange any activities or visits you would like to do during your stay. Additionally, they offer you a whole list of proposals and hints with good restaurants and their phone numbers etc. – a great service in this rural area! The closest airport is Reus which is forty minutes by road. Barcelona EL PRAT is an hour and forty five minutes by road. There is a train station at Mora La Nova and a bus station at Mora D’Ebre. If you are arriving by public transport, the owners Debbie and Nick can provide information and help on renting cars, bicycles or motorcycles. They’re also happy to help with local transport to and from these stations. To explore the area properly, it’s necessary to have a car, motorcycle or a bicycle.